Stacey Abrams wins Democratic primary in Georgia. She could become the nation’s first black woman governor. Stacey Abrams (top left) won the Democratic nomination in a race showcasing divergent Democratic strategies on how to win in Georgia, a Republican-dominated southern state. In the Texas governor’s race, Democrats tapped former Dallas County Sheriff Lupe Valdez (top right), the first openly gay and first Latina nominee for governor. In a San Antonio-Mexican border district, Gina Ortiz Jones (bottom right), an Air Force veteran and former intelligence officer, got Democrats’ nod to face Republican Will Hurd in November. Kentucky Democrats picked a female former Marine fighter pilot, Amy McGrath (bottom left), in a snub to the party establishment for a U.S. House seat district that Democrats hope to put into play. 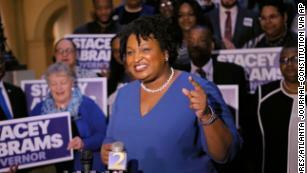 Washington (CNN) Stacey Abrams will win the Democratic primary in Georgia’s gubernatorial race Tuesday, CNN projects, becoming the first black woman in the nation to hold a major party’s nomination for governor. If she wins in November, she will become the country’s first black female governor. In the interview, Abrams also recounted a story about being rejected as a high school student at the gates of the Georgia Governor’s Mansion at an event honoring the state’s top students. “In front of the most powerful place in Georgia, telling me I don’t belong there, that’s resonated for me for the last 20 years. The reality is having a right to be places does not always mean that you’ll gain admission,” she said. Abrams’ status as an African-American with strong progressive support, as well as Georgia’s status as an early primary and marquee general election state, made her campaign a major draw for national Democratic figures. Hillary Clinton and Vermont Sen. Bernie Sanders endorsed Abrams, and New Jersey Sen. Cory Booker and California Sen. Kamala Harris went to Georgia to campaign for her. The Republican race, meanwhile, could be headed to a runoff, with none of the six candidates — including Lt. Gov. Casey Cagle and secretary of state Brian Kemp — currently holding a majority of the vote. If no candidate tops 50%, the top two will advance to a one-on-one runoff on July 24 to decide who will take on Abrams. CNN’s Kyung Lah contributed to this report.